Joe Percoco, a former top aide to New York Gov. Andrew Cuomo (D.), was sentenced to six years in prison on Thursday following a conviction on a six-figure bribery scheme. "I hope this sentence will be heard in Albany," Manhattan Federal District Court Judge Valerie Caproni said. 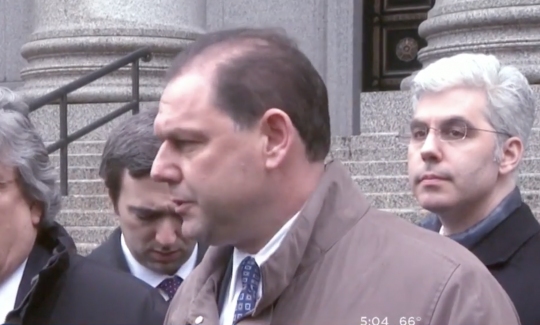 A jury found Percoco guilty of accepting $287,000 from Competitive Power Ventures, a Maryland-based company building a natural-gas-fired power plant in Orange County, and $35,000 from COR Development, a Syracuse-area developer. Percoco then helped push for a power-purchasing agreement and emissions reciprocity deal worth millions to CPV, as well as reversing a decision that would have inflated COR's labor costs on a Syracuse project and approving a raise for the son of COR executive Steven Aiello, who was then working for Cuomo. Percoco also used his influence to secure a $7,500-per-month job for his wife, Lisa, with Competitive Power Ventures. She only worked a few hours a week designing lessons for school children, the New York Post reported. Percoco managed Cuomo's first two campaigns for New York governor—Cuomo recently won the Democratic nomination as he seeks a third term in November—and he served as executive deputy secretary for much of his first two terms. For government watchdogs, the trial illuminated the swamp of corruption in Albany, as well as officials' refusal to address it. After Mr. Percoco's conviction, Mr. Cuomo pledged to "put additional safeguards in place to secure the public trust." But such safeguards have yet to materialize. This entry was posted in Politics and tagged Andrew Cuomo. Bookmark the permalink.